Give autonomy to your corporate customers! Solution designed specifically to easily handle corporate travel and optimize the travel management processes between agencies and companies. 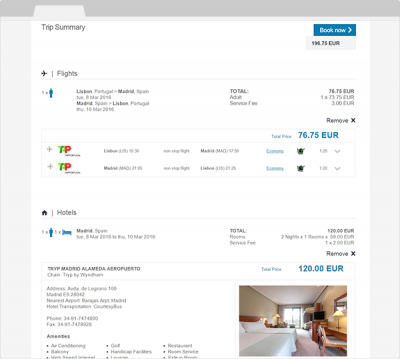 It offers a fast booking flow to travellers and a truly simple management experience to travel agents. Network and Low cost carriers, hotels and rent-a-car content is available. Supports Apollo, Galileo and Worldspan and all data is synchronized in real time. The web-based application and its mobile apps for iOS and Android allows you to use it on desktop, laptop, hybrid and mobile. The solution is available in English and Spanish and is prepared to accommodate other languages. To better aligned with travel agencies business model, TTS Corporate does not have setup or booking costs. Check out how TTS Corporate turns simple and free what has been complex and expensive! Customization offers travel agencies the ability to tailor the tool according with their own and their company exact needs. 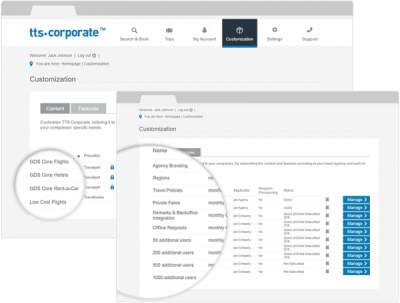 Travel agencies can activate specific content and features just for specific companies and offer their companies a tool as settings-rich as each company needs. 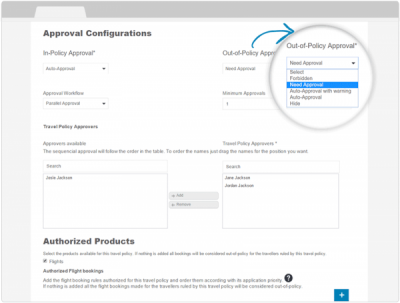 Setup your content and advanced features according to the business rules of your travel agency and the ones agreed between you and your companies. 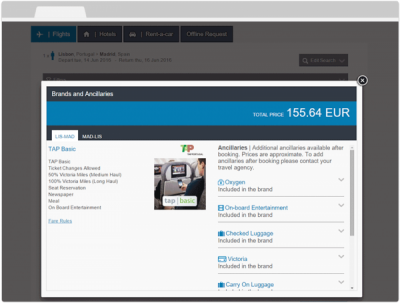 You can define globally or per company, each content settings like payment logic, carrier preferences, queues, among others, as well as advanced features settings like agency branding where you can add a logo and specify a colour scheme or specify per company which private fares they can access, and much more. 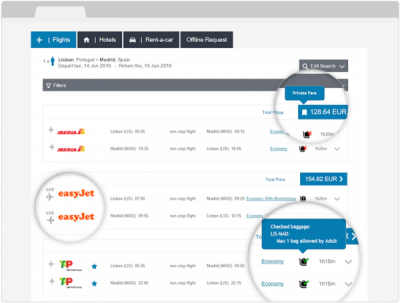 TTS Corporate users and travellers can easily check the benefits and restrictions of each fare, access additional airline content and the ancillaries available for the flights distributed by the GDS whenever flights have rich content and branding available. Yes, even simple setups take time. 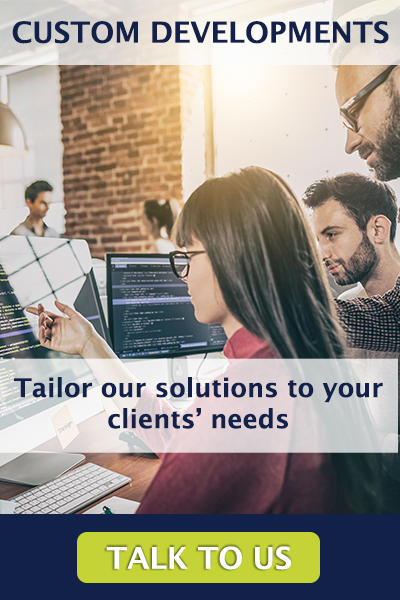 Subscribe Managed Services to ask TTS to do your TTS Corporate’s configurations for you, so you can dedicate your time to the business itself. Like any customizable feature in TTS Corporate, you choose if you want and how you want to use it. This offers you the flexibility of having us managing everything for you or just the things you want. It’s all up to you. TTS Corporate is also available for mobile environments. The mobile extension is a native app that includes the TTS Corporate’s features relevant for the business traveler in an optimized experience for tablets and smartphones. Available for iOS and Android. Reduces booking time and optimizes communication between agencies and their corporate clients reducing errors and misunderstandings. The autonomy it brings is widely perceived as better service by corporate clients which contributes to increase client loyalty and retention. Optimized communication and processes reduce administrative work enabling agents to focus more on business and less in procedure execution, while booking autonomy with automated policy validation enables travel management delegation within the companies. Booking decisions are made with complete knowledge of all available offers while keeping access to their own and their agency negotiated fares. 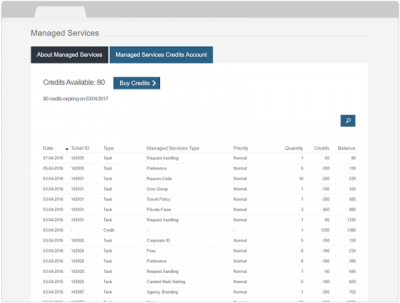 How many corporations do you expect to service on the Corporate Booking Solution? What is the size of your corporate customers? What is the type of your corporate accounts? What Corporate Booking Tool are you using to service those customers?